India Vs Australia 1st test as many dramatic situations and at last won by Australia . The 1st test match for Virat Kohli as captain and also the second one to score two back to back centuries as captain in there first test. All the batsman performed well on those fast bouncing pitches but are not able make for there side . During the match there was a small rival betwen Shikhar Dhawan and David Warner . Virat is also in the incident . the fight took place during the fourth day of the test match . When Warner was recalled to bat again after Varun Aaron No Ball delivary David Warner as made some comments on Bowler and Shikhar Dhawan who is nearby reacted there. 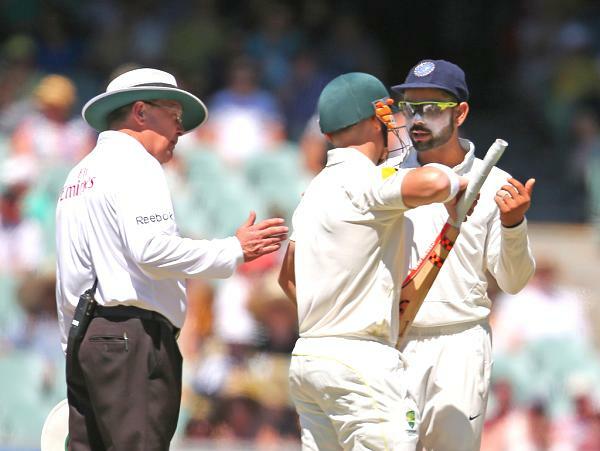 During the match the was exchange of words between Rohit Sharma and Steve Smith . when there is appeal for LBW . The three players where fined for the incidentt and thee International Cricket Council (ICC) as made an announcement .Virat Kohli and Shikhar Dhawan will have a short for 30% from their match fee .and David Warner with 15% only . There are some criticizing over Virat Kohli captaincy and how he set the field . However he managed to make good scores and also made a good effort to have match for his side but cannot make due to his wrong shot selection and hope Viratimprove in his Captaincy in course of time .